Bharatpur from a rival Jat chief in 1733. Known as the Lohagarh or Iron Fort, it proved to be an almost impregnable citadel. It is sited at the north-west corner of the walled city and was built with massive double ramparts reinforced by eight bastions, surrounded by a wide moat. The baradari stands on the summit of the Jawahur Burj, a bastion in the north-west corner of the fort. 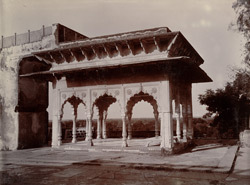 It is an open pavilion with three cusped arches on each side and a double cornice. There is a panoramic view from its elevated position, glimpsed here in the distance.